A friend who is a source for many very funny anecdotes recently sent this picture her cousin took while driving through Arkansas. I've tried to think of a funny caption but I've come to the conclusion that this picture is worth at least 1000 words. Maybe 1001. What's the best church name you've come across? Here in Missouri we have a small town named Halfway--sporting Halfway Baptist Church and Halfway Christian Church. But I think Flippin COG takes the cake, man! When I lived in Temple, Texas the big joke was the initials of First United Methodist Church - FUMC. Or F.U. Methodist Church as we called it. I remember living near a "Little Hope Baptist Church" for several years. That's probably my favorite. 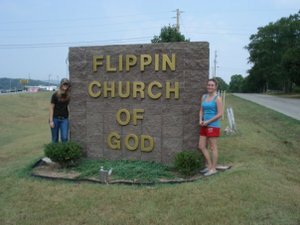 Flippin Church, somewhere in Freakin Arkansas! Somewhere in southwestern Virginia (Tazewell county? ), on a small mountain road, drove past St. Mary's Presbyterian Church.